NQC 2018: The Song Goes On! PIGEON FORGE, Tenn. – Over 40,000 people from all over the United States and all over the world – including Sri Lanka, the Netherlands, Ireland, Australia, Brazil and Canada – enjoyed the very best in gospel music at the 61st NQC, the National Quartet Convention. Approximately 100 hours of music, inspiring messages, and moving testimonies filled the halls of the LeConte Center in Pigeon Forge, TN over the past week. The final day and evening of NQC is always bittersweet – savoring the last moments but having to say goodbye to friends you may only see once a year. This morning, the Hoppers led worship for chapel, followed by a moving message from Dr. Tim Hill. Always a highlight of NQC, Gerald Wolfe brought out the red back hymnal to lead the crowd in classic songs of the church at the Gospel Music Hymn Sing. Next up, it was the Matinee Quartet Extravaganza – you just can’t beat that four-part harmony – with Ernie Haase & Signature Sound, Kingdom Heirs, Mark Trammell Quartet, Tribute, Triumphant, and Second Half Quartet. The evening concerts were hosted by Bill Bailey. Tonight’s performers were: Rochesters, Dixie Melody Boys, Childress Family, Erwins, Chandlers, Kingsmen, Roarks, Mylon Hayes Family, Mark Bishop, Browns, Greater Vision, Jonathan Wilburn, Rick Webb Family, Kingdom Heirs, Talleys, Second-Half Quartet, Jim Brady Trio, Tribute Quartet and the Whisnants. There was a sweet spirit of prayer and a holy reverance throughout the performances tonight with many groups sharing songs and testimonies about the role of prayer in their lives. There’s always been a strong tie of patriotism in Gospel music and tonight, the NQC paid honor to the USA with a special “Grand Finale” – I LOVE AMERICA – filled with patriotic songs. Special performances included: “God Bless America” by Melissa Brady, “God Bless The USA” by Joseph Habedank and the Erwins, as well as audience sing-alongs including “The National Anthem,” “You’re A Grand Ole Flag,” and more. 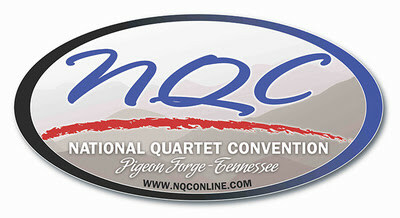 NQC 2019 will be held September 22, 2019 – September 28, 2019 at the LeConte Center in Pigeon Forge, TN. Seats will go on sale October 15, 2018. Log onto www.NQConline.com for more information. NQC – the National Quartet Convention – was founded in 1957 by gospel music legend and former backup vocalist for Elvis Presley, J.D. Sumner who co-produced the event with James Blackwood. The annual convention was moved in later years to Nashville, TN and then to Louisville, KY where it was held for 20 years. Posted in announcements | Comments Off on NQC 2018: The Song Goes On!